The Standard EasyCrease Pro combines exceptional channel-creasing capability, remarkable productivity, and convenient semi-automatic operation in a compact desktop design. The EasyCrease Pro 14 is ideally suited for creasing toner based digitally imaged stocks, and also excels with ink-printed images on a diverse range of paper stocks and laminations. The unique channel-creasing action of the EasyCrease Pro virtually eliminates the common problem of cosmetic damage and imperfections cause by folding paper stock along an edge. The EasyCrease Pro has a clearly marked indicator scale for accurate positioning of each crease. Speed-Stops quickly lock into position along the scale to assure that each crease is positioned accurately and consistently from one sheet to the next. Performing multiple creases is particularly simple and efficient with the Speed-Stops unique rotary paper stop design and additional speed and convenience is added with the electric foot petal operation which leaves both hands free. To help assure optimal results on any paper stock the operator can choose between two precision channel-creasing thickness modes and the changeover only takes seconds. The selector knob is simply rotated to select either the narrow or wide creasing head. In one even motion the EasyCreasePro applies a high quality crease across the sheet. The result helps to insure that the professional image quality of the sheet and its printed image is retained even after being folded. The Standard Duplicating Easy Crease Pro 14 Creaser is an electric and semi-automatic creasing machine that will crease one sheet at a time, with a maximum sheet width of 14.5”. It takes just 3 seconds per crease, and has a maximum score width of 14.125″. If you have any questions or are interested in the Easy Crease Pro 14, visit us at SpiralBinding.com. 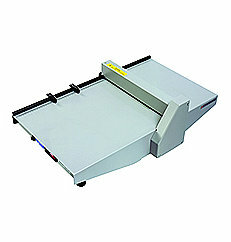 We have great pricing on a full line of Creasing Machines. Call us at 1-800-631-3572 for more information!